Product #21222 | SKU 40S963 | 0.0 (no ratings yet) Thanks for your rating! 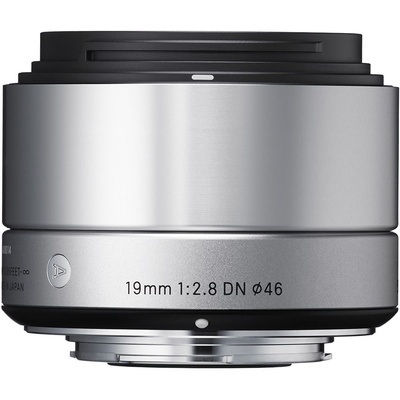 The silver 19mm f/2.8 DN Lens for Micro Four Thirds Cameras from Sigm a is a wide-angle prime lens for Micro Four Thirds cameras. Its 35mm focal length equivalency is 38mm and its minimum focus distance is 20 cm. Its f/2.8 maximum aperture is ideal for shallow depth of field imaging and allows it to maintain sharpness in low light situations. An inner focusing system means the lens does not extend when focusing and its newly developed linear autofocus motor is accurate and quiet. Sigma's Super Multi-Layer Coating reduces flare and ghosting and provides sharp and high contrast images even at the maximum aperture, and with three glass moulded aspherical elements, aberrations are kept to a minimum. The result is accurate colour definition and sharp imaging across the frame. Three glass moulded aspherical elements and Super Multi-Layer Coating minimises aberrations and reduces flare and ghosting for sharp, high contrast images.